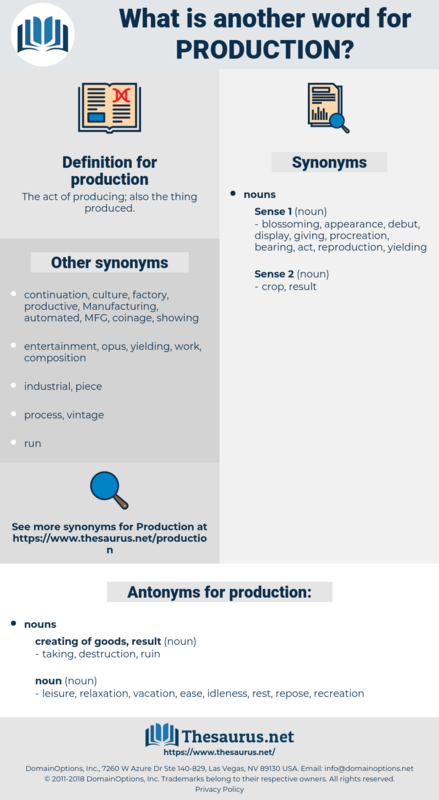 What is another word for production? The act of producing; also the thing produced. co-production, coproduction, reproduction, overproduction, publication, introduction. procedures, stockpiles, manufacture, manufactures, alternatives, departments, data, farmers, substitutes, landings, methods. Bis, data, abstraction, input, distribution, issuance, preparedness, childbirth. Manufacturing, productive, produced, produce, produces, producer, producers, productivity, Producing, fabrication, industrialization. 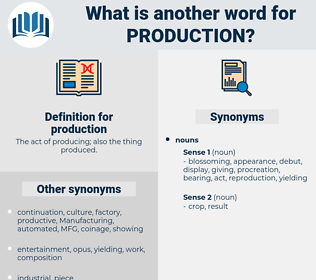 Manufacturing, manufacture, productive, produced, produce, producer, productivity, printing, throughput, stockbreeding, Producing, fabrication, industrialization, growing. leisure, relaxation, vacation, ease, idleness, rest, repose, recreation. Since then factory production has gone up fifty per cent. What about production, Mr. Matheson? drilling, mass production, underproduction, generation, rainmaking, steel production, breeding, boring, excavation, oil production, fashioning, brewing, yield, canalisation, cultivation, capacity, overproduction, making, devising, output, quarrying, overrun, canalization, growing, mining, foliation, sericulture. creative activity, deed, exhibition, human action, industry, act, manufacture, creation, human activity.